Monday August 19 1907 I got the breakfast over, prepared things for dinner, did up lunch for Lorna, will took her things in the buggy and we went in at 9.37. She started home at 10.38. We came home I got our dinners and took a nap in afternoon. Mrs. Close and sisters were here for a call. 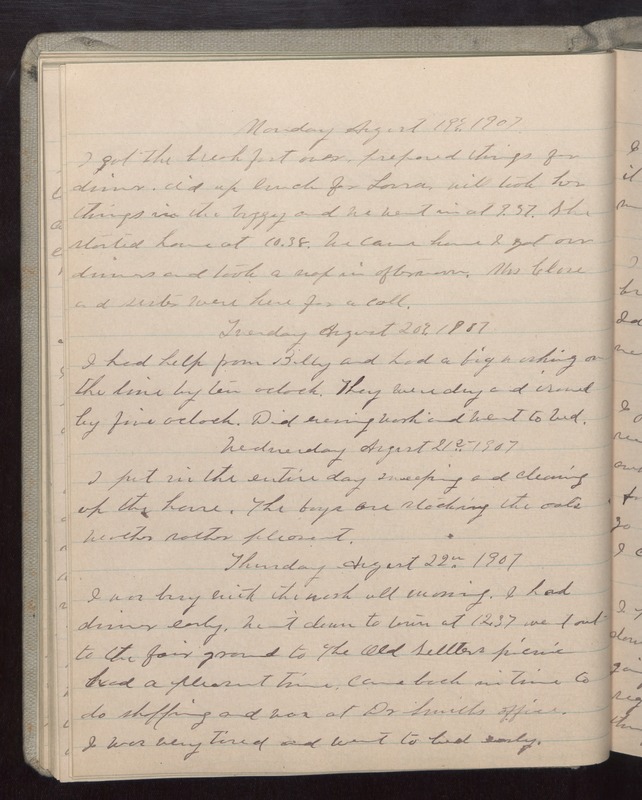 Tuesday August 20 1907 I had help from Billy and had a big washing on the time by ten oclock. They were dry and ironed by five oclock. Did evening work and went to bed. Wednesday August 21st 1907 I put in the entire day sweeping and cleaning up the house. The boys are stocking the oats Weather rather pleasant. Thursday August 22 1907 I was busy with the work all morning. I had dinner early. Went down to town at 12.37 Went out to the fair ground to The Old Settlers picnic had a pleasant time. Came back in time to do shopping and was at Dr Smiths office. I was very tired and went to bed early.